There are lots of good health, environmental and economic reasons for using bikes as replacement for other forms of transport and recreation. However, on average, your chances of being killed or injured are much higher when riding a bike than travelling by car. This post looks at some of the advantages and disadvantages of riding a bike instead of travelling by car. It is also worth noting here that travel time using public transport (and to some extent bikes) can be part of work planning time at the start of the day or winding down time at the end of the day. Driving a car just adds to the daily stress. To get a feel for comparative travel times I used Google maps travel time estimates for the 12.5 km trip from home (Chapel Hill 4069) to my old workplace at Southbank (leaving home at 8.40 AM.) The estimated times were 50 mins by bus + walking, 21 mins by car and 46 mins by bike. (NOTE: The 46 mins is about right based on the time it takes me (age 71) to make the trip on a mountain bike. The 21 mins estimate by car is wild optimism for travelling to the CBD at 8.40 AM) Once exercise time is taken account of the bike ride looks pretty good. NOTE: The actual number of bike riders killed per year is low (8 bike riders were killed for 2007/08 in the area studied.) As might be expected from this low number there is considerable difference in the number of deaths from year to year. International experience demonstrates that cycling safety can be improved markedly using the same sort of strategic planning that has been used to improve safety for car occupants. • placing greater responsibility for traffic safety through the legal system on those road users who have the potential to cause the most harm to others. with car occupants. A survey of Toronto commuter cyclists found that bicycle accident rates per kilometre cycled were between 26 and 68 times higher than similar rates for car travel, and the authors reported much lower cyclist accident rates for a similar survey conducted in Ottawa, Canada. These large geographical variations in cyclist injury rates and in relative risks for cyclists and car occupants indicate substantial differences in driving/cycling conditions, including road infrastructure and driver/cyclist behaviour. Bicycle crashes are most common (61%) at intersections. 12% of bike rider casualties occur when a driver or rider who is turning right fails to give way to an oncoming vehicle travelling straight through. 10% of bike rider casualties occur when a driver or rider fails to give way at a cross-section. 10% of bike rider casualties occur when a driver opens their door into the path of a bike rider. This is much higher in inner Melbourne. 9% of fatal and serious injury to bike riders occurs when it is mainly the rider coming off the footpath. 8% of fatal and serious injury to bike riders occurs when it is mainly the car driver emerging from a driveway. It is worth noting that only one of the causes listed by Vicroads did not involve an interaction with other vehicles and that this cause accounted for only 9% of fatal and serious injuries. The implication here is that priority should be given to action that keeps bikes separate from other vehicles. Dedicated bikeways are highly desirable. However, replacing parking spaces with separated bike lanes like the ones below go a long way to help. Replacing parking spaces with separate bikeways may meet resistance. The prompt for this post was this article that looks at the strategies used by a number of cities to overcome resistance. There are other bits of simple infrastructure that may help. In some cases this may be as simple as putting in a stop sign for bikes where there is a dangerous road crossing. Keep safe on your bicycle. Obey the road laws and be alert to the traffic around you. Ride in the same direction as other traffic and keep your bicycle one metre from the kerb. Try to make eye contact with other road users to help them know that you are there. Look out for other road users particularly when they are approaching you from behind or pulling out in front of you. Look out for drivers and passengers getting in and out of parked cars and be aware of the risk of car doors opening. Don’t ride on the inside of larger vehicles such as buses and trucks – the drivers can’t see you and these vehicles may be turning which will require more space than a normal passenger car. Be careful riding over tram tracks, especially in wet weather. Wear a correctly fitted, Australian standards approved, bicycle helmet. Take extra care when cycling at night. It is harder for drivers to see you and for you to see hazards. Try to ride on well-lit roads and wear bright or light coloured clothing or a reflective vest. When riding at night or in conditions of low light, your bike must have a white front light, a rear red light, both visible from at least 200 metres, and a red rear reflector visible from at least 50 metres. Ride defensively. This means being alert to other vehicles and acting predictably yourself. When using a single lane roundabout, ride in the middle of the lane. This is so you are more visible to other road users and you are less likely to be cut off when other road users are exiting the roundabout. When riding through a multi-lane roundabout you are permitted to ride in the left lane, even if you are turning right. If you do, you must give way to vehicles exiting the roundabout. Make sure you signal your intentions and where possible, try to make eye contact. When using a shared path or separated footpath, ride in a manner and a speed that will enable you to give way to pedestrians. Always let people walking or slower bike riders know you are about to pass by ringing your bell or simply calling out. We recommend that children under the age of twelve years ride under adult supervision. Crashes between cars and bicycles are more likely to occur when light is poor. Bike riders are most difficult to see when they are approaching a vehicle and the driver is viewing them from the front. It is more likely that you will be seen by drivers if you wear a brightly coloured top that makes you stand out. There are also reflective vests or similar accessories that you may want to consider wearing to improve your chances of being seen. This is the law. If you do not use lights at night or in conditions of low light, penalties may apply. The front and rear lights must be visible from 200m and the bicycle must also have a red rear reflector visible from 50 metres. Bike riders who do not have bicycle lights fitted to the front and rear of their bicycles are very difficult to see at night. Drivers and other road users should look out for bike riders. However, some may not, so to help drivers see you, you should ride in a prominent position on the road at a distance of approximately one metre from parked cars. You should also obey traffic signals and stop signs. Very narrow tyres make it easier to lose control when there is loose gravel. Handlebars that allow you to sit up straight give better visibility and more control. Me, I am going to keep on riding my bike in places i think are safe to do so. And take even more care than I do at the moment. 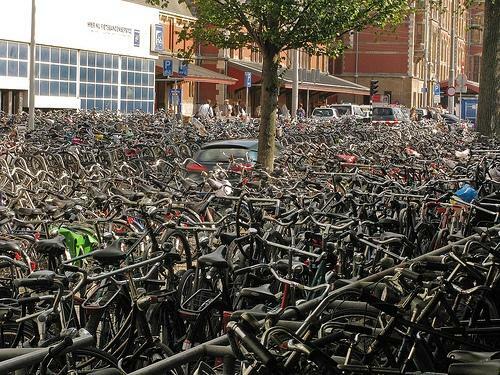 If you want to see bicycles, take a look at this! Readers might also enjoy my 2009 post Bicycles in Amsterdam, where you see some very strange bikes and nary a helmet. Here in Europe bikers get their kit off to ride naked for the environment. In Qld,and perhaps other States, legislation was passed that required car to pass bikes by certain margins. A metre up t 60 kph and 1.5 metres above that speed. Sensibly drivers are allowed to cross a no-passing line to enable the proper clearance from the bike. I don’t know of any statistics that show reduced injuries or deaths, but the change in driver behaviour is profound, most cars clearly giving bikers a generous clear space when overtaking. Some responsibility for bikers was added: no going through red lights on a bike was reiterated. Curiously though, bikes are not required to carry day time lights. Some of the LED lights available now are truly excellent. From the rear a flashing red is very helpful. The bright front light is excellent because it reveals the distant presence of a cyclist long before he can be seen as a biker. Great if you are overtaking to know there is a biker approaching. Parking space for bikes? Not likely up our way except for the notional stuff we see outside the public buildings. Developers seek to make all their space revenue-earning and unlikely to surrender much space except so-called “orphan space” . Councils could help by allowing the allocation of car space to bike space. But many commercial applications negotiate a lesser parking space than is prescribed in the Planning Scheme anyway so I don’t hold much hope for that in our region. And whatever the merits are of cycling, in the tropics you will normally sweat profusely on your way to work – it’s not nice walking into your office dripping wet. So for a large part of the year bikes are not well used (in the tropics) and the existing parking spaces mostly unoccupied. Sadly that makes it difficult to justify an increase in bike parking spaces. I love you number two, Brian, and I remember very clearly your 2009 post, I clipped most of those images. Was that really 6 years ago??? What have we achieved? I’m getting my gear off right now and going for a ride…….for the environment. from April to Dec 2014 , 33 cars were booked for failing to maintain clearance while 832 cyclists were charged for improper turns, failing to give way, signal or keep left, illegal U turns, disobeying signs and following too closely. No accident stats were provided. If I was serious about riding to work in the tropics I would go for an electric bike. Use the power to avoid hot and sweaty going to work and use manual power to get my exercise on the way home. What you said about using lights during daylight hours makes sense.